Transcendent is the first word that comes to mind in describing Albina Shagimuratova’s portrayal of the ill-fated heroine of Donizetti’s masterpiece, Lucia di Lammermoor, on opening night of LA Opera’s new production. With crystalline technique and heartrending beauty, Shagimuratova gave us the full flavor of Lucia’s fragility, bravery, and madness. One felt in the presence of a great Lucia. Surprisingly, the “duet” of the evening (with no slight to the stirring tenor of Saimir Pirgu as Edgardo) came in the pairing of the “voice” of the glass harmonica, as played last night by Thomas Bloch, with Shagimuratova’s. The mad scene, originally scored for glass harmonica by Donizetti, is rarely performed with the instrument. Thankfully, music director and conductor James Conlon gave the Los Angeles audience the opportunity to hear Bloch draw ghostly yet sprightly murmurings from the glass harmonica. Juxtaposed with Shagimuratova’s agile, brilliant soprano, the result was a haunting transparency – an otherworldly sound that mesmerized and transported one to another dimension. The glass harmonica became the voice in Shagimuratova’s head, another manifestation of her madness; and we felt as if we were in touch with the inner workings of Lucia’s mind. If the measure of a great coloratura soprano is Lucia’s mad scene, then Shagimuratova triumphed. She revealed and illuminated every twist and turn of Lucia’s compromised psyche with the dramatic intensity of her acting and the infinite shadings of her beautiful voice. Lucia di Lammermoor, based on Sir Walter Scott’s The Bride of Lammermoor, published in 1819 in the age of the Romantic novel, is set in a time and place steeped in the remnants of medieval Europe with its battling clans and feudal rivalries. Director Elkhanah Pulitzer chose to update the setting to 1885, in the wake of the Industrial Revolution and prior to the Suffragettes’ fight for women’s rights. Though Pulitzer’s notion to focus on the status of women (which the opera itself certainly comments on) was admirable, the later time setting seemed to serve no particular purpose. If anything, one felt somewhat of a disconnect between the action of Salvatore Cammarano’s libretto and the period depicted on stage. That said, there were touches in the unfolding drama that beguiled and illuminated – in particular the depiction of the female guests and their husbands in the Act Two scene of the signing of Lucia’s disastrous marriage contract to Arturo (Lord Arthur Bucklaw). Partnered by their husbands, the women sang a bright chorus. Arms bent at the elbows and extended in a stylized pose of supplication, they were held by the wrist by their mates, rather than by the hand. That gesture spoke volumes about the use and misuse of women. The sets, minimalist in style, had much to recommend them; but again, because of the confusion of the time period, they lacked a certain coherence. On the positive side, the interior scenes were characterized by vivid colors and stark planes, allowing us to see the passions enacted on stage with a kind of clarity not typical in the gloomy interiors of the more traditional Scottish settings. Borrowing from a range of contemporary artists such as Ellsworth Kelly, James Turrell, Dan Flavin, and Donald Judd, the designs of Carolina Angulo felt a bit derivative. Where she succeeded completely was in the Act Two great hall with its massive, modernist staircase. At the top of the stairs, a blue rectangle was projected onto the wall. Lucia emerged from the rectangle, bloodstained and half crazed – a Greek mythic heroine, timeless and epic. The rectangle was transformed into a black disc, on whose surface splashings of bright red meandered and pulsed, reflecting the bloody trail left by Lucia in the wake of Arturo’s murder. Little of the environment of Scotland permeated the interior sets and costumes, but the exterior scenes made reference to the Northern landscape with ghostly tombs, billowing mist, and backdrops punctuated with black, grey, and white. All the sets, both interior and exterior, benefitted from the dramatic lighting of designer Duane Schuler. The costumes by Christine Crook were simple, reflecting the concerns of the late-nineteenth-century setting. Maestro Conlon with his unceasing sensitivity and intelligence and the LA Opera Orchestra with their rigorous technique met all the demands of the bel canto score, becoming the heartbeat of the opera: crisp, buoyant, moody, and reflective all at once. If Shagimuratova put one in mind of a tragic Greek heroine, than the singers of the LA Opera under Grant Gershon had the potency of a Greek chorus, setting scenes and commenting on the action to create a dynamic background of sound. Unlike Tosca and Cavaradossi, Mimi and Rodolfo, Carmen and Don José, or many other famous tragic couples, Lucia and Edgardo spend more of the opera apart than together. No sooner do they meet by the well in Act One, then Edgardo is off to France, only to return to find Lucia surrounded by guests and relatives at the signing of the marriage contract. Their only passionate scene is in Act One, and even then their love duet is marred by Edgardo’s vengeful feelings toward Lucia’s family who have robbed him of his title, his parents, and his land. We meet Edgardo in this state of fierce passion, due both to the injustice perpetrated on him by Lucia’s brother, Enrico, and to his intense feeling for Lucia. Saimir Pirgu as Edgardo began at full tilt with his bracing tenor, but as the opera and plot developed he pulled back, navigating the transition to repentant suitor; and his voice took on a sweetness and lyricism, bringing one to tears in his final aria, “Tu che a dio spiegasti l’ali” (“Tho’ from earth thou’st flown before me”). With his silky baritone, Stephen Powell portrayed the vengeful Enrico with the imperiousness demanded of the role. As Lucia’s brother, a man willing to sacrifice his sister for personal gain, Enrico is one of opera’s most villainous characters. Yet with his vocal shadings and his depth of tone, Powell manages to make Enrico’s inhumanity almost comprehensible. As Raimondo, Chaplain at Lammermoor, James Creswell, who also sang the role of Dansker in LA Opera’s Billy Budd this month, was a standout. The voice of reason in the midst of chaos, Raimondo is a pivotal character. 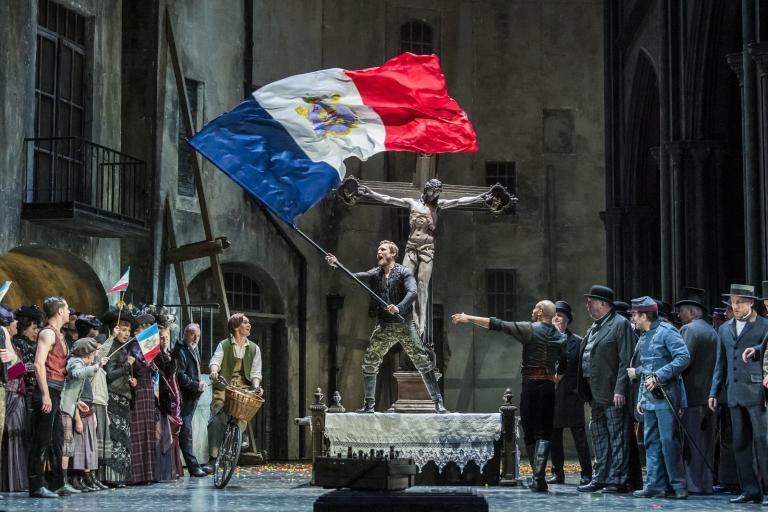 Without a singer and actor of stature, the drama loses its center, and Creswell proved a worthy choice for the basso role, accommodating both high and low notes with fluid grace. Rounding out the cast were mezzo soprano D’Ana Lombard as Alisa, tenor Vladimir Dmitruk as Arturo, and tenor Joshua Guerrero as Normanno. In the sextet “Chi mi frena” (“What restrains me”), as notable in this opera as the mad scene, all six principals and orchestra performed as a harmonious whole, bringing to the stage of the Dorothy Chandler Pavilion unrestrained warmth and fervor. This might be said of the whole evening. We in the audience were transported to a world of high romance and high art by the vocalizations of this magnificent Lucia.